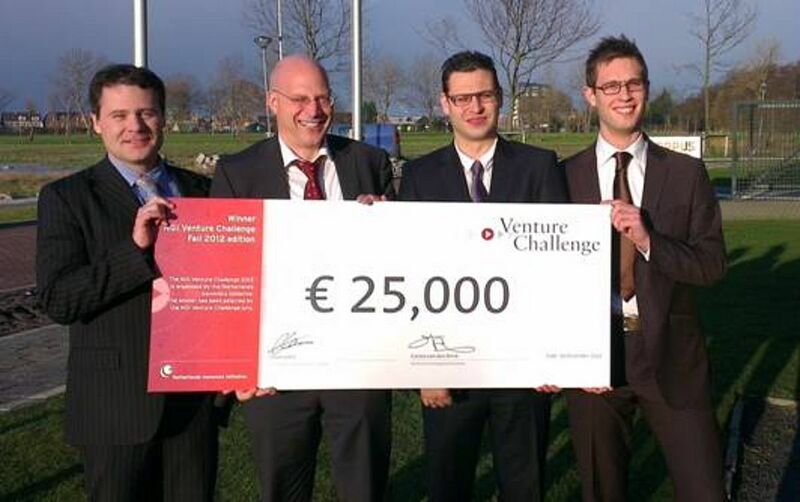 A team around Prof. Martin Spitzer and Dr. Sven Schnichels from the University Eye Hospital Tübingen and from the Zernike Institute for Advanced Materials won the Dutch Venture Challenge Fall 2012. This event is organized by the Netherlands Genomic Institute (NGI) to stimulate the valorization of scientific discoveries made in academic environments. The Nano-I-Drops team at the Dutch Lifescience and Health Conference in Oegstgeest after the award ceremony. From left to right: Prof. Dr. M.S. Spitzer (Tübingen) , Prof. Dr. A. Herrmann (Groningen), Dr. S. Schnichels (Tübingen) and J.W. de Vries (Groningen). The Nano-I-Drops team with Chrétien Herben, Manager NGI Valorisation, at the Dutch Lifescience and Health Conference during the award ceremony. From left to right: Prof. Dr. M.S. Spitzer (Tübingen) , J.W. de Vries (Groningen), Prof. Dr. A. Herrmann (Groningen) and Dr. S. Schnichels (Tübingen) and Chrétien Herben. 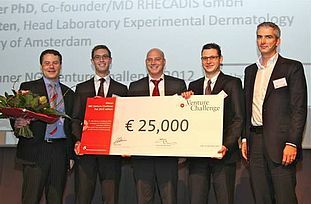 The Nano-I-Drops team presented an innovative ophthalmic drug delivery system. Eye drops usually contain extremely high concentrations of drugs because eye lid movement and tear fluid wash away the active compound. This leads to sometimes severe side-effects and poor compliance. The bi-national team developed a nanoparticle formulation that significantly increases the survival time of drugs on the eye. The new therapeutic modality allows the application of much lower drug concentrations for the treatment of glaucoma and eye infections; and at the same time reduces adverse side-effects. The 25.000 Euro award will be utilized to spin out a company from the University and collect more data to enter clinical trials.